Termites are highly destructive to douglas fir and other common building timbers. They can rapidly eat out the internal sections of structural timbers – devouring mainly the spring wood, and preferring to leave the harder summer wood sections. As a result, infested timbers are often left as a thin shell with a honey-comb of layered hollow sections packed with moist soil. 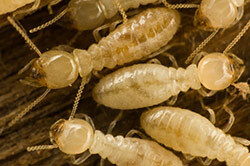 These termites love a moist dark damp environment – it is essential for their survival. The termite is a serious economic timber pest causing millions of dollars of damage throughout the areas where it is located. It is estimated that more than 1 in 5 homes in the high activity areas, been or will be attacked at sometime by these voracious little insects.